Imbolc is one of the four Gaelic Fire Festivals of the Pagan year celebrated annually on the first day of February. Astronomically however Imbolc often occurs a little later. Since it is a Cross Quarter day, the midpoint between Winter Solstice and Spring Equinox, its date can vary between 2nd & 7th February. In 2018, Imbolc is on 3rd February and this is why we have chosen it as the theme for our yoga and creative writing retreat, Into the light. A physical and metaphorical transition between winter and spring. 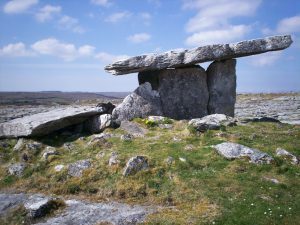 In some ancient cultures such as the Neolithic (Stone Age) people built monuments aligned to major solar events – Winter & Summer Solstice, Spring & Autumn Equinox, as well as the Cross Quarter Days of Imbolc, Beltane (1st May), Lughnasadh (1st August), and Samhain(1st October). Imbolc was significant as marking the beginning of spring. As a child, I knew Imbolc as St. Brigid’s Day. It was my Irish mother, who told me the story of Saint Brigid, born in County Louth in Ireland in the 5th century. Brigid was a famous abbess and foundress of several nunneries, including that of Kildare. Throughout my childhood, she became a symbol of female strength, and power especially when I was told that prayers to St. Brigid could still the wind and rain! What I loved most about celebrating St.Brigid’s Day as a child was the feeling of looking forward to the coming year, and ultimately to my future. What I might make happen, rather than what might happen to me. I treasured my St. Brigid’s Cross, a small cross woven from rushes, which traditionally hung over doors in Irish homes as a protection against Fire and Evil. My St.Brigid’s Cross was in the form of a brooch that I would pin onto my dress. The centre of it was square and woven of green reeds, with four arms tied at the ends and radiating outwards. I was fascinated by the simple perfection of its construction, and used to run my fingers up and down the reeds as a sort of meditation. I now know that my St. Brigid’s Cross was a visible symbol of the Pagan origins of St. Brigid’s day. 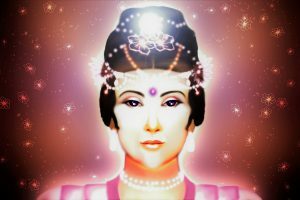 It was a representation of the sun, and the growing light of the new spring. 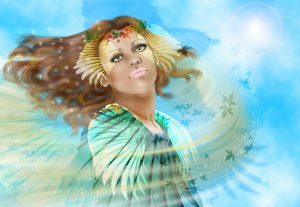 When Ireland converted to Christianity in the 5th century, Imbolc, or the festival of the Pagan Goddess Brigid was transformed into St. Brigid’s day. There is even some debate over whether the Christian St. Brigid even existed at all, and that Early Christian monks created her in the image of Brigid, a Celtic Goddess of the same name, who brought inspiration to poets and was associated with fire and the home hearth. Another theory is that Brigid was a famous druid who converted to Christianity. Whether St. Brigid existed or not, much of the mythology surrounding her is mirrored in the aura of the Goddess. 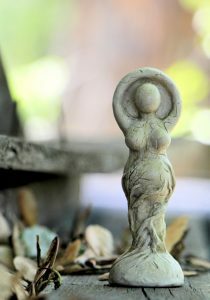 Fire is an important aspect of The Goddess Brigid, bringing warmth, light, and representing the spark of creativity. 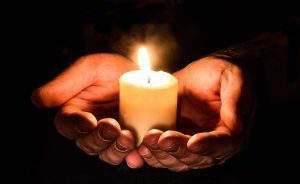 It is traditional to light a candle / candles on St. Brigid’s Day to honour the Goddess and her gift of fire. One of the Imbolc rituals that I follow is to put out a bowl of milk in offering. It is derived from the Pagan tradition to pour milk on the ground as a libation to the earth and the sea. 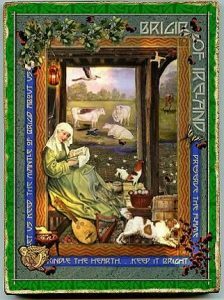 Indeed the word Imbolc comes from the Old Irish I mbolg meaning in the belly – the time when sheep begin to lactate, their udders fill with milk as the grass began to grow after winter. 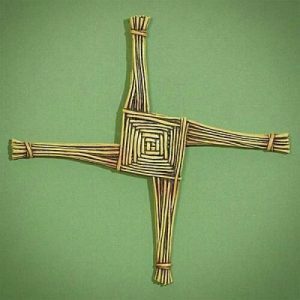 St. Brigid herself was reputed to be an expert dairywoman, could cure infertility, and increase the farmers’ herds of cattle. 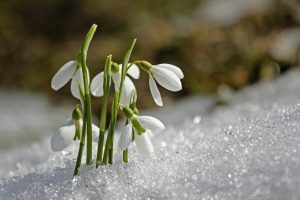 Another symbol of Imbolc is the snowdrop. Most often, the first flower to bloom in the year, the purity of its white petals links to the iconography surrounding both the Pagan and Christian Brigid. It was a medieval tradition to plant snowdrops around monasteries to cleanse the earth after winter. For me snowdrops represent new beginnings. Beautiful in their fragility, yet also resilient to survive wintry temperatures, and hard times. The snowdrops are symbols of the creative ideas that have longevity. Stories that gestate during winter, over the busy Christmas period, to manifest as spring reaches us. The first days of February are a time when I often start a new book with renewed purpose. One of the most important aspects of Imbolc is the element of home and the hearth. It is likely that the notion of spring-cleaning comes from the old Celtic Festival. And so, the time of Imbolc is also about getting my house in order, clearing out old junk and making space for creating new work. It is about taking steps towards bringing together my body and my mind in harmony, renewing my yoga practice and building focus for my creative endeavours in the coming year.